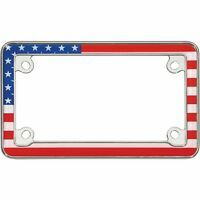 Cruiser 23003 USA Flag License Plate Frame Chrome Plated Plastic - Gear Guys! yourcardetails has no other items for sale. This frame is awesome. You can tell it will never fade. I want one for my car now. The selker is awesome too. They stayed in contact every step of the way. They also made sure i was happy with product after delivery i stead of just waiting on feedback. They are 5 star dealers fir sure !!! Nice frame and flag design looks great! Love the flag design around the frame. Looks great on my black motorcycle! I bought this for a friend who has a motorcycle. He's so proud of his tag!